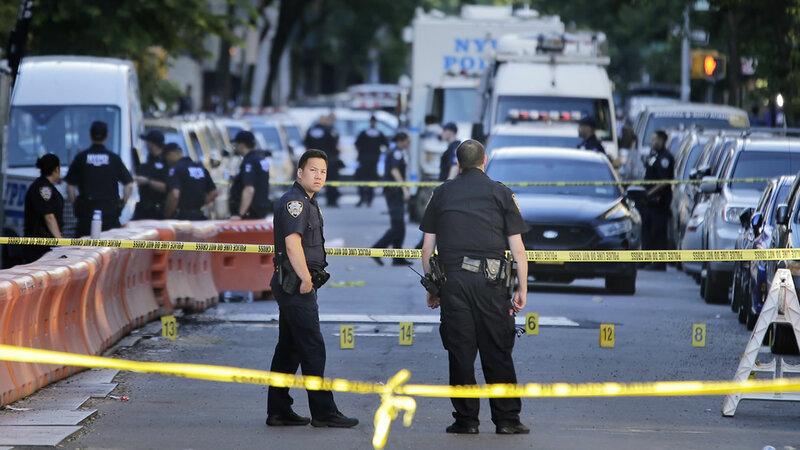 NEW YORK -- A New York City police officer was killed in an ambush attack while sitting in a police RV early Wednesday. Police say Officer Miosotis Familia was killed by Alexander Bonds, an ex-convict who once ranted online about police getting away with killing people. Authorities say officers fatally shot Bonds after he pulled a gun on them. Click here for full coverage on the shooting death of Officer Familia. Here's a look at other cases of ambushed police officers. A white man with a history of racial provocations and confrontations with police ambushed and fatally shot two white officers in separate attacks as they sat in their patrol cars in suburban Des Moines. Scott Michael Greene pleaded guilty last month in the deaths Urbandale Officer Justin Martin, 24, and Des Moines Sgt. Anthony Beminio, 38. He was sentenced to consecutive life prison terms. A gunman in Dallas opened fire on police officers working at a protest of back-to-back killings of black men by police in Minnesota and Louisiana. The attacker, Micah Johnson, killed five officers and wounded nine others and two civilians before police killed him with a robot-delivered bomb when negotiations failed. Authorities say Johnson, who was black, told negotiators he wanted to kill as many white police officers as he could. It was the deadliest day for American law enforcement since Sept. 11, 2001. Officer Guarionex Candelario Rivera showed up unannounced at his police station in Ponce, Puerto Rico, and fatally shot three fellow officers. Candelario, a 19-year police veteran, killed Lt. Luz Soto Segarra, Cmdr. Frank Roman Rodriguez and policewoman Rosario Hernandez De Hoyos. Candelario was shot twice but survived. Two Hattiesburg, Mississippi, police officers, Benjamin Deen and Liquori Tate, were shot to death during a traffic stop. Three suspects were later arrested. Two New York City police officers, Wenjian Liu and Rafael Ramos, were ambushed and shot to death in their vehicle without warning by a man who approached the passenger window of their marked police car. The suspect, 28-year-old Ismaaiyl Brinsley, then fatally shot himself. Brinsley was black; the officers were Asian and Hispanic. In the moments leading up to the attack, Brinsley posted online he wanted to kill "pigs" in retaliation for the death of Eric Garner, an unarmed black man killed by police. A survivalist ambushed two Pennsylvania state troopers outside a police barracks late at night, killing Cpl. Bryon Dickson and wounding Trooper Alex Douglass. Suspect Eric Frein led authorities on a 48-day manhunt through the heavily wooded Pocono Mountains before U.S. marshals captured him at an abandoned airplane hangar. He has pleaded not guilty. A man and a woman ambushed two police officers eating lunch at a Las Vegas pizza restaurant, fatally shooting them before fleeing to a nearby Wal-Mart, where they killed a third person and then themselves in an apparent suicide pact. Officers Alyn Beck and Igor Soldo died. Two police officers were ambushed in the tiny Alaskan village of Hoonah before a SWAT team and dozens of other officers surrounded a house where the gunman took refuge. Officers Tony Wallace and Matt Tokuoka died after the shooting. Hoonah resident John Marvin Jr. was captured and charged in the deaths. Two West Memphis, Arkansas, police officers doing anti-drug work were shot to death by two men wielding AK-47s along a busy Arkansas interstate. Sgt. Brandon Paudert and Officer Bill Evans died at a nearby hospital. The suspects were later killed in a shootout that injured the local sheriff and a deputy at a crowded Wal-Mart parking lot. Four police officers were shot and killed in an ambush in a coffee shop in Lakewood, Washington, by ex-convict Maurice Clemmons. The killed officers were Mark Renninger, Ronald Owens, Tina Griswold and Greg Richards. Clemmons was shot and killed by police after a two-day manhunt. University of Nevada, Reno Police Sgt. George Sullivan was ambushed and attacked with a hatchet while doing paperwork in his squad car. Siaosi Vanisi was later convicted and sentenced to death for Sullivan's slaying. Witnesses testified that Vanisi stalked Sullivan after repeatedly telling friends and relatives he wanted to kill a police officer. Mark James Essex, a member of the Black Panthers who was discharged from the Navy for going AWOL, killed nine people in New Orleans, including five police officers, in two sniper attacks. Essex was shot more than 200 times by police sharpshooters Jan. 7. Authorities said the walls of his apartment were covered in anti-white graffiti. Career criminals Bobby Davis and Jack Twinning killed four California state troopers in a four-minute gunbattle in Los Angeles County. Twinning killed himself when authorities surrounded a house where he was holding a hostage; Davis was soon arrested and, almost three decades later, killed himself at Kern State Prison. Members of a nationalist party seeking to overthrow the government of Puerto Rico shot and killed eight police officers in San Juan, including Chief Aurelio Miranda-Rivera. The revolt was put down by the U.S. military, the FBI and the CIA. Six officers from two Missouri agencies were killed as they surrounded a house where two suspects wanted in the murder of a Greene County marshal were holed up. The suspects fled to Texas and killed themselves when authorities tracked them down.